Sadly, over 2.7 million shelter animals are euthanized every year before they are able to find their forever homes. (Source: Animal 24-7 published by Merritt Clifton). What’s even more heartbreaking is that just 30% of pets in the United States are adopted from rescue facilities. (Source: The Humane Society of the United States 2013). This means that a staggering 70% of pets are still being purchased from breeders. As a pet parent of five rescue dogs and three cats, I’ve never understood why people looking to adopt often immediately seek out a breeder. They pay thousands of dollars for a custom canine or cat when their perfect match could be just around the corner at their local animal shelter. The shelter won’t have the specific breed I’m looking for. Shelter animals have behavioral issues. I want to know my pet’s linage. If I buy from a breeder, my pet’s temperament will be perfect. There are hundreds of rescue groups and organizations across the country that are dedicated to specific dog and cat breeds. I even know of several that only deal with differently-abled animals (blind, deaf, etc.). Many shelter programs incorporate training into the animals’ daily routines. If the prospective pet does have any issues, the shelter staff or foster parents will be able to inform potential adopters so that there won’t be any surprises post adoption. 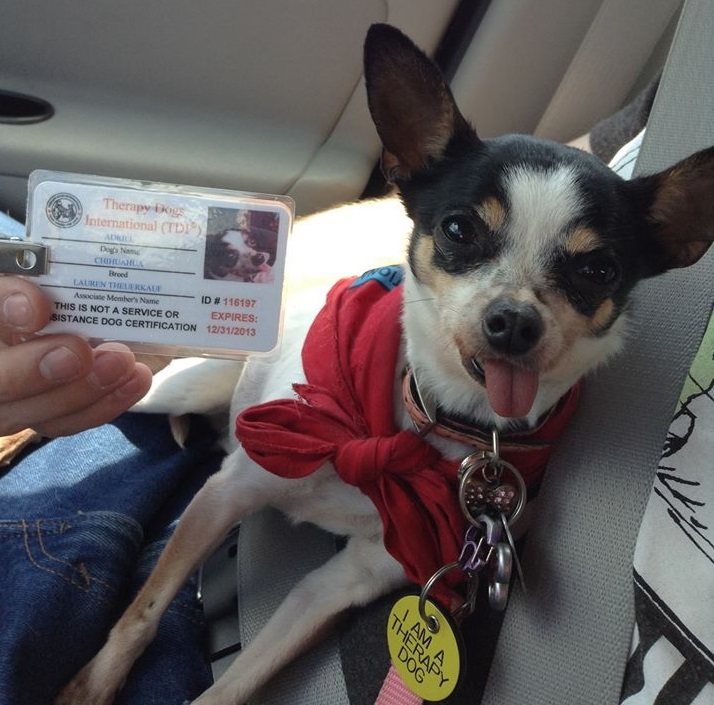 Unless you plan on breeding or showing your new dog or cat, there is no real value in knowing your pet’s linage or having official papers. Also, it has been proven that mixed breed animals have less inherited genetic health problems than purebreds. Shelter animals have the added benefit of gaining socialization skills. From group walks to day trips with their foster families, shelter animals get to experience the world around them. However, animals coming from breeders are often kept in isolation to ensure that the bloodlines will remain pure. I would like to share the adoption stories of four of my dogs: Theo, Penny, Adriel, and Hope. Theo and Penny were almost euthanized while Adriel and Hope were rescued from backyard breeders. Here are their stories. Theo: While not much is known about Theo’s past, one thing is for certain: He was abused by children. Whenever Theo saw a child, he would fly into a barking and snarling frenzy while hiding behind our legs. This is probably why he was dumped at the local humane society and labeled as vicious. None of the staff could get close to Theo. He was tired of being abused. He was shut down. The date for his euthanasia was set. Two hours before Theo was to be killed, a woman specializing in Pug rescues came into the shelter. She was immediately drawn to Theo. The staff warned her that his time was up and he couldn’t be rehabilitated. The woman decided to try anyway. There she sat on the cold, hard concrete for two hours straight. Theo had stopped snarling. He sat next to the steel bars of the door and allowed the woman to pet him. The staff was amazed when the woman left the building with Theo in tow, smiling. Theo is now 15 years young. If it wasn’t for the kindness and patience of this woman, his life would have been cut drastically short. Theo is now 15 years old! Penny: Penny was found roaming the streets of California. She was immediately taken to a high-kill shelter. 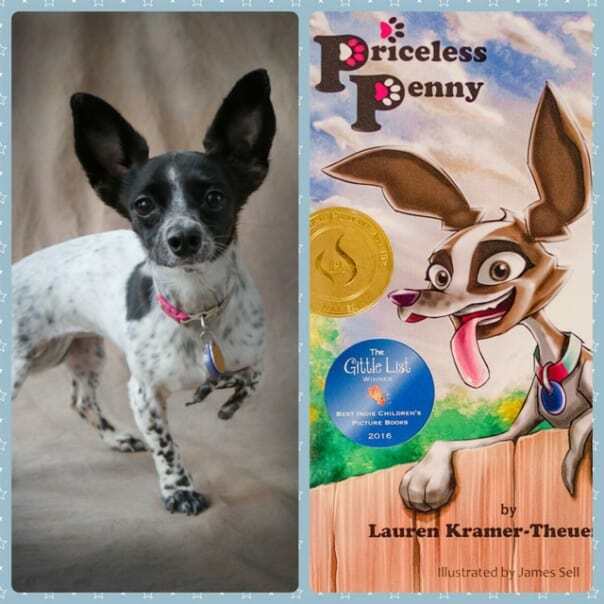 While Penny was a sweet and loving pooch, her unique looks made her undesirable in the eyes of would-be adopters. She was born with a deformed front paw and a severe overbite. One day, a woman entered the shelter and discovered Penny. She immediately made a call to her veterinarian friend, Cynthia Lee, who just happened to own Second Chance Animal Rescue in Springfield, Illinois. Lee wasted no time in getting Penny out of the shelter. In fact, she paid an animal transporter to drive Penny from California to the rescue in Illinois. Penny’s adoption profile was posted on Petfinder.com. Still, no one wanted to adopt a seemingly “broken” dog. Then I came across her biography and fell in love the moment I saw her picture. Adriel: Adriel was rescued from a backyard breeder. She had been kept in a wire crate for most of her young life. Her leg muscles did not develop properly because of this and she is unable to jump. Adriel was also born with a very distinctive birth defect: Her tongue is longer than her head so it always sticks out. 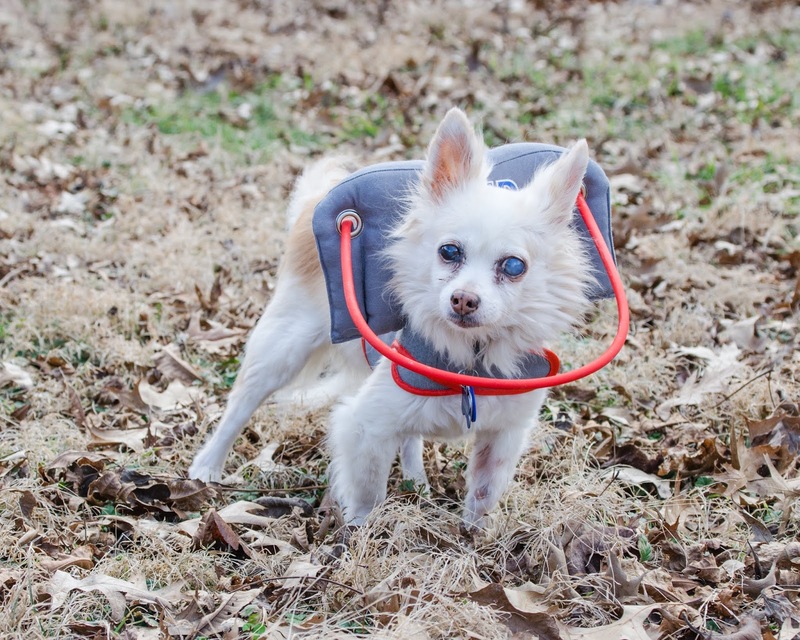 From the moment I saw Adriel’s picture on the St. Louis Senior Dog Project website, I knew she should be a part of our furry family. When the adoption application was approved, we were overjoyed. I couldn’t wait to bring her home. Several weeks later, I picked her up at the local Petsmart. While I was excited, Adriel was terrified. Her dark brown eyes darted back and forth. She actually held her legs stiffly out in front of her so that she wouldn’t get close to my face or chest. I feared that she didn’t like me. Bringing her home was also difficult. She ran and hid from me and my husband…but fell in love with our resident dog, Theo. While they bonded quickly, it took several months before Adriel felt she could trust us. My husband and I worked diligently on training and studied up on dogs that had been rescued from breeders. We soon learned that her terror was associated with the human interaction she received while at the breeder’s facility. Thankfully, with love and patience, Adriel soon blossomed into the world’s best lap dog. She now eagerly soaks up attention from everyone that she meets and will paw at the person if they stop petting her. Adriel is also a certified therapy dog with Therapy Dogs International where she provides touch therapy to kids’ clubs, nursing home residents, Autism groups, etc. Adriel has been a therapy dog for 7 years! Hope: Hope is the product of a backyard breeder. 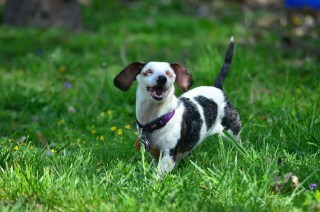 She is a mini double dapple Dachshund that was born without eyes and is completely deaf. Her breeder bred two dapple Dachshunds together knowing that doing so can result in double dapples, which often have health issues such as being born blind, deaf, or both. The exotic white coloring of the Dachshund pups in double dapple litters is highly sought after by adopters. Often times, they have no idea what a cruel practice this is. Upon finding out that Hope was both blind and deaf, he wanted to kill her. She was useless to him because he couldn’t breed her. Thankfully, the man’s wife stepped in and claimed Hope as her own. Hope was protected for several years until the woman died. The breeder than took Hope with a choke chain around her neck and surrendered her to Dachshund Rescue North America. The first week post adoption was daunting. My husband and I watched helplessly as she excitedly raced around the house running head first into the walls. But, she never made a sound. Hope simply backed up and went in another direction. By the end of the week, she had learned the entire layout of the house. Two months later, she taught herself to bark at the back door when she wanted to go out and potty and knew to come back to the door and bark to be let in. She might be differently-abled but never disabled! Hope has been featured on The Dodo where her video went viral with over 5.5 million views. She has also been featured on numerous Facebook and Instagram pages. Hope has over 7,000 followers on Instagram and receives messages daily about what an inspiration she is. One person in particular sent a private message to her Facebook page stating that seeing Hope living such a wonderful life helps the person cope with his/her depression. Hope is known as the Queen Ween on Instagram! I hope that these stories inspire you to adopt from your local animal shelter or rescue group. Together, we can end the needless killing of animals; be a voice for the voiceless; and ensure that all creatures find a loving forever home. Please take a moment today to remember those animals whose time ran out before they could be united with their forever families. FCVC hopes your heart was warmed by this article as much as ours was. If you have the heart to adopt a special needs pet, we will welcome you into our practice with open arms. (Please try to adopt from a local rescue or shelter.) We love all our dog and cat pet friends and give each and everyone the best possible care we can. We look forward to meeting the members of your pet family! Articles you may find of interest – Adopt a Less Adoptable Pet 4 Love and Adopt A Pet Search.